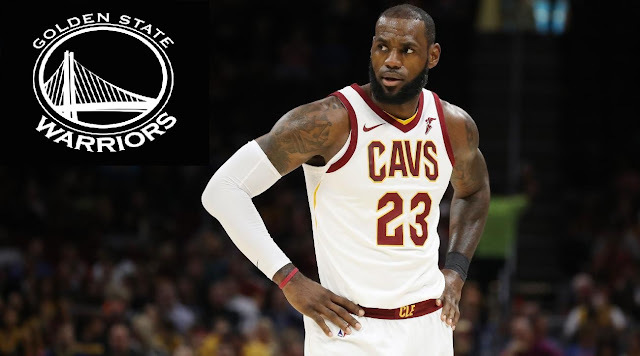 NBA – The hottest news in the National Basketball Association today is the rumors that Cleveland Cavaliers superstar LeBron James will join his rival in NBA Finals for 3 straight seasons the Golden State Warriors once he hit the 2018 free agency? Although the news was just pure speculations, but nonetheless it becomes the hottest news in basketball all over the world. According to report the rumors came out of the Warriors side were the defending NBA Champion has one more slot to sign a max player or superstar player which they believe they could possibly sign the greatest player in the NBA today LeBron James. Some Warriors players have asked if the rumors of LeBron James joining the Warriors are true? David West said if he will join the team he better steal Draymond Green’s jersey #23? Kevin Durant was also asked about the rumors and said the B.S. word after the reporter asked the question and then said ” "In this league, just like a couple years ago, my coming here, nobody would have thought that," "It's part of me as a basketball player that's just like, let's just worry about basketball. Then on the other side, we know this is a business as well." Meanwhile, LeBron James has already denied the rumors and said “If it’s not from me, It’s not true” James will hit the Free Agency this summer and many NBA Teams are showing interest of acquiring his services comes the free agency. LA Lakers, LA Clippers, Houston Rockets and even Cleveland Cavaliers are among the teams that could landed James? While the latest team to surface that could sign James are the Golden State Warriors which both parties have recently denied the rumors of joining forces this coming summer? No Comment to " LeBron James Denied the Rumors of Joining the Warriors in Free Agency "